DENVER – September 17, 2018 – This fall, anime fans are set to discover that nothing is better than big screen binge-watching the most critically-acclaimed sports anime ever released. Crunchyroll and Fathom Events will bring episodes one through twelve of the ground-breaking animated show “Yuri!!! 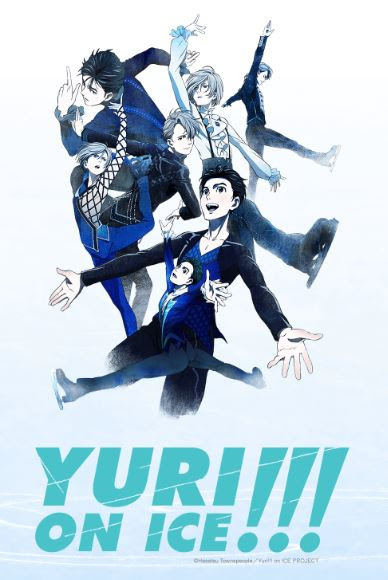 on ICE” to select U.S. cinemas in a one day marathon with “Yuri!!! on ICE Series Marathon.” In addition to viewing the 12 episodes with friends and fellow fans, attendees will view a video message from the series’ producer along with a “hello” from Makkachin, Victor Nikiforov's pet poodle. Tickets for “Yuri!!! on ICE Series Marathon” are available at www.FathomEvents.com and participating box offices. “Yuri!!! on ICE Series Marathon” comes to a limited footprint of more than 95 U.S. cinemas on Saturday, October 13 at noon local time (subbed). A complete list of theater locations is available on the Fathom Events website (theaters and participants are subject to change). “Yuri!!! on ICE” follows a Japanese figure skater, the titular Yuri Katsuki, his coach, Russian figure-skating champion Victor Nikiforov, and emerging Russian skater Yuri Plisetsky during the Figure Skating Grand Prix. In addition to winning numerous awards and fan polls, the lauded series also attracted praise from professional figure skaters, with some olympians skating to music from the show at the 2018 Winter Olympics. The series was produced by MAPPA, directed by Sayo Yamamoto, and written by Mitsurō Kubo. Figure skating choreographer, coach, and former competitive ice dancer Kenji Miyamoto choreographed the realistic skating sequences by performing the routines himself. For artwork/photos related to “Yuri!!! on ICE Series Marathon,” visit the Fathom Events press site. Crunchyroll is the world’s largest destination for anime and manga, boasting a global community of more than 40 million registered users and over 1 million subscribers. Fans connect through the most complete anime library including "Naruto Shippuden," "Attack on Titan," and “Dragon Ball Super,” events such as Crunchyroll Expo, Anime Awards, Crunchyroll News, and can purchase related merchandise through its online store. Through its app on game consoles, set-top boxes, mobile devices and more, Crunchyroll delivers content from leading media producers directly to viewers translated professionally in multiple languages. The service is available for free or through a premium offering that allows users to watch ad-free with access to simulcasts—top series available immediately after Japanese broadcast.